I couldn’t sleep any longer; the squawking parrots and growing heat made sure of that. With a dry mouth and dawning headache, I sat up in my sleeping bag and looked around. My khaki shorts were tossed onto a pile of rocks, my sandals were scattered upon the ground and my legs had escaped the bag and were now lying in the sand. A swarm of black ants encircled me, but kept their distance. I suppose it was the one positive effect of having not showered in 72 hours. My newest travel partner, an Australian guy named David, was about a hundred feet from my encampment, still lying motionless in the shade of a gum tree. I stared at him for a long moment with a deep envy before peeling a sweaty sleeping roll off my body. Then my ant friends and I waited patiently for David to stir to life. After he awoke, we decided a short hike might do our bodies well and help us devise a new plan for the day. 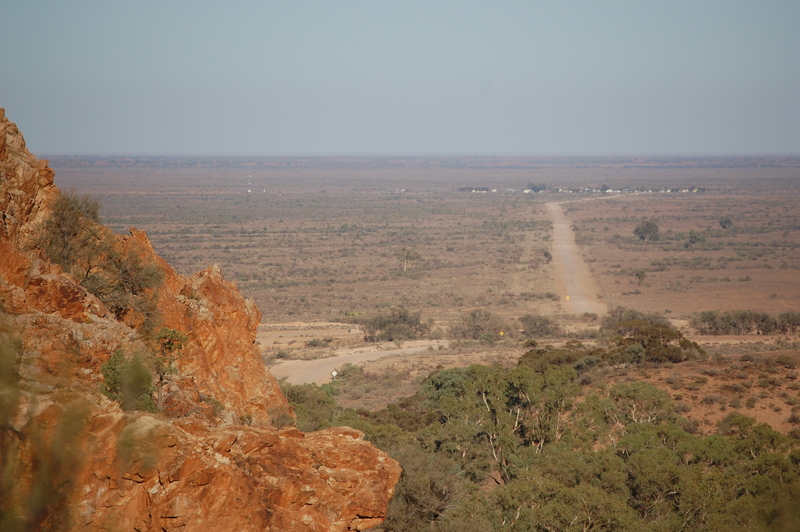 The afternoon before, we learned the nearby National Park was closing for the day to allow professional hunters to shoot feral goats from foot, vehicle and helicopter. While I was in full support of blasting goats from aircraft, this news put a hitch in our backpacking trip. In most places on earth, a slight change in plans isn’t a huge deal. 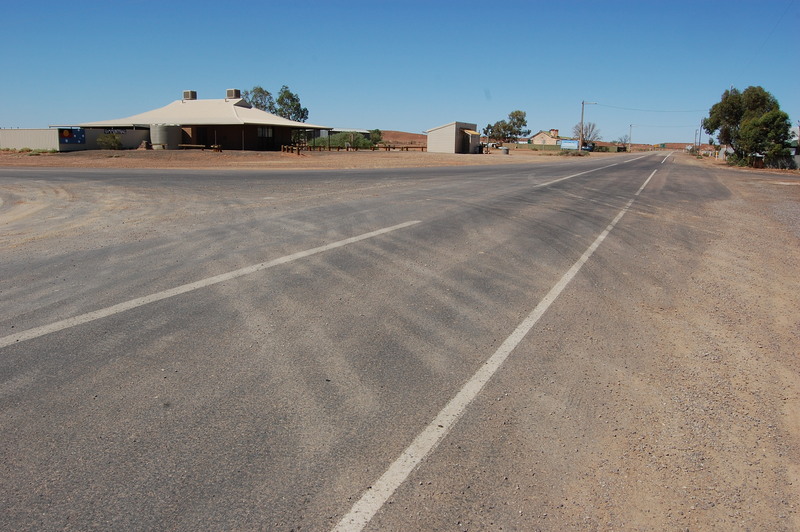 But in rural Australia, the phrase “well, I guess we could always…” has very few possible endings. And most of those include alcohol – an option we didn’t wish to consider that morning. So, we climbed to the summit of a nearby peak where the views of crumbling mountainsides were only broken in one direction. To the west, a dirt road ran from the end of the mountain range to a far off clump of trees and buildings. Somewhere near that little piece of civilization was Parachilna Pub – the source of our previous night’s joy and present morning’s misery. 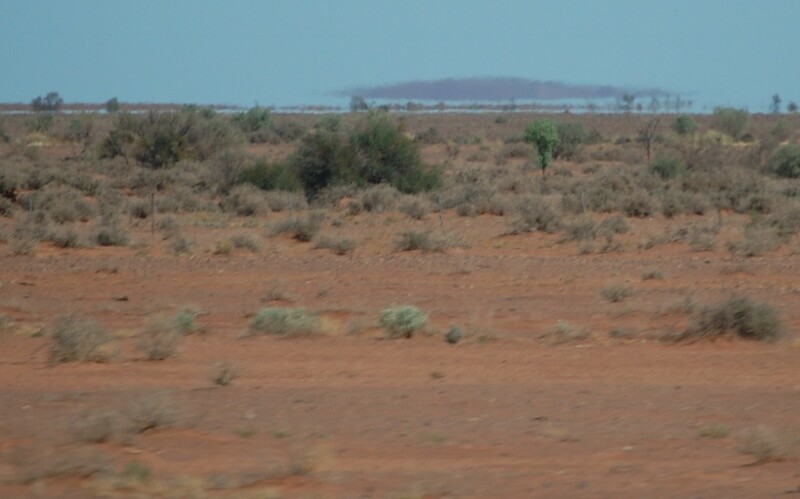 Beyond that, an arid plain stretched undisturbed to a distant horizon. 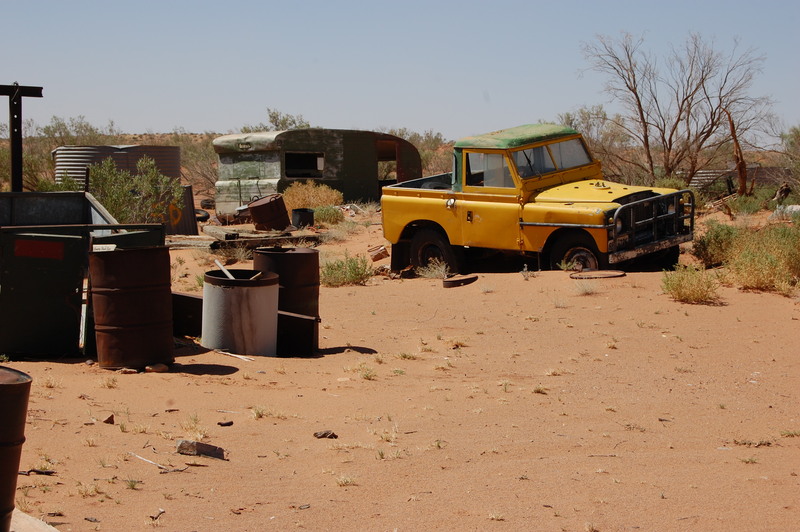 Out there was the less glamorous Australian Outback; the part lacking festive beach barbeques and scantily clad women, the part the steakhouse commercials from back home failed to show. We stood for a few minutes and stared out into the tan abyss. “Well,” David said without breaking his gaze. “I guess we could always drive out there.” I didn’t know what, if anything, to expect from out there. But, in lieu of better options, I was willing to find out. “Sounds like a plan.” I said. Once off the mountain, we got into David’s car and headed out into the vast, open country Australians often vaguely refer to as the Never Never. The two-lane highway we traveled skirted the edge of the ranges before the mountains began to peter out and fade into the plains. Soon the radio station went the way of the mountains and became garbled and faint. 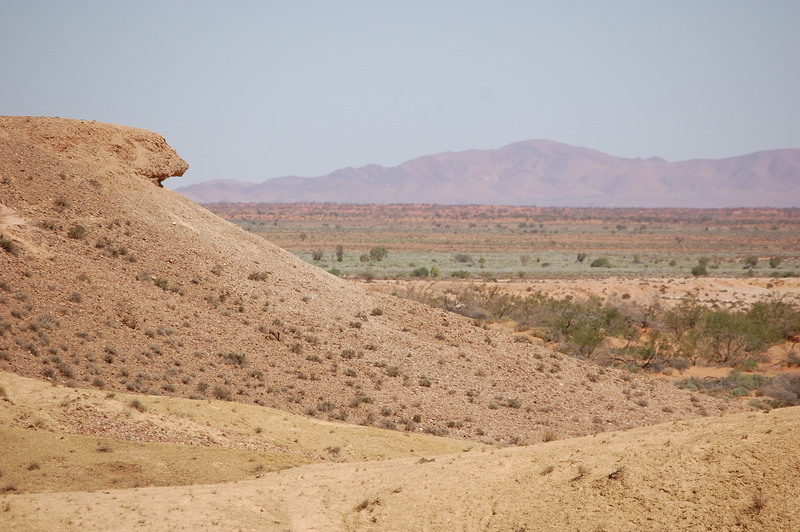 A strong breeze carried dust along the barren ground, where only stunted shrubs grew. Some twenty miles away, a remote mountain peak floated above the horizon, undercut by a mirage of sky. The term ‘Never Never’ was beginning to make sense when we reached a point where the asphalt, fence lines and vegetation vanished. David stopped the car for a moment and we both stared out the front windshield, giving us the opportunity to appreciate what nothing, in all its glory, looked like. 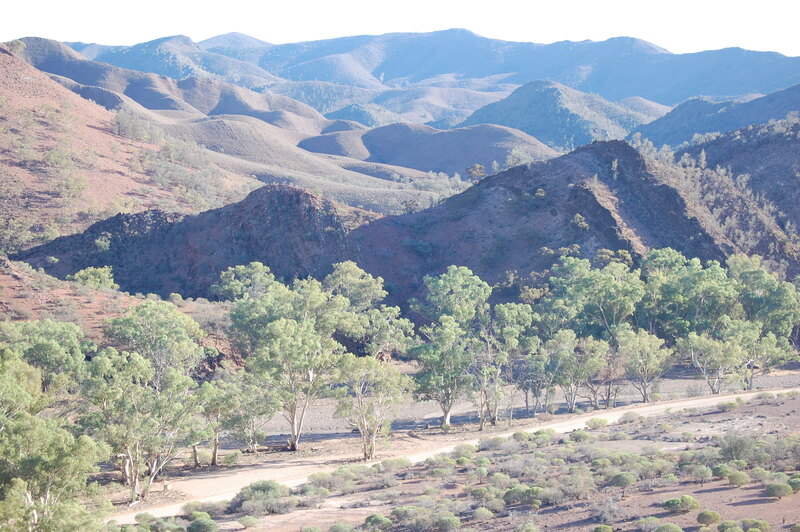 There was no denying it now; we were truly in the outback. A few minutes later we arrived at the small outpost of Lyndhurst and pulled into a petrol station. 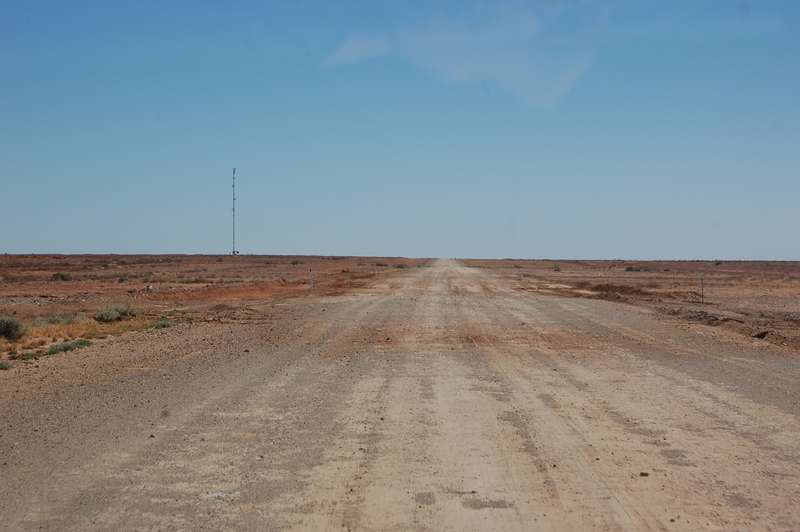 A sign across the road read “Next Service Innamincka 473.” I had been to desolate outback towns before, but many of them were so famous for their remoteness, they had become gimmicky. This town, Lyndhurst, was desolate without the fanfare. I took a short stroll to confirm its emptiness. There wasn’t a soul around and the only noise was the occasional crash of metal siding, windblown racket from a nearby junkyard. For ten minutes, I crept around buildings with the polite quietness one only typically demonstrates in a library… or graveyard. If there were people in those structures, I was betting they weren’t the kind of folk that like to be disturbed. A dog stood barking at the edge of the complex while I sat still, contemplating how much of a good idea it was to exit the vehicle. If horror movies have taught me anything, it’s that people always become crazier the further away you get from urban centers. And it didn’t get much further away than this. Sitting there, I couldn’t help but look at the old barrels and think of Snowtown. Surely a man whose property consisted of sand and rusty metal scraps could do better than barrels of low-grade acid. But, then I reasoned that if it were a trap, we were probably already caught. So, I opened the door and stepped out onto the sand. Walking a few steps behind David, I approached the compound. A figure of a man began to take shape in the shadows below a tin roof. As he advanced towards us, I tried to shake the feeling that something bad was bound to happen before the day’s end… something worse than going another 24 hours without a shower. As always, the first draft was reviewed and edited by Katie Chassaing. On the second draft, however, I was left to my own devices. So any errors you may find reflect my incompetence, not Miss Chassaing’s.